On November 16, the House passed its version of a tax plan while the Senate passed the bill by a narrow margin of 51-49 last Saturday. President Trump would like to complete the process by the holidays but an early 2018 completion date seems more likely in Citi's view. Now that both chambers have passed their separate plans, they will go to a conference committee to reconcile their differences, write a joint plan and bring a final bill to the president's desk. Lower taxes on businesses: Both plans reduce taxes on corporations from 35% to 20% but the Senate version would delay a corporate cut until 2019. 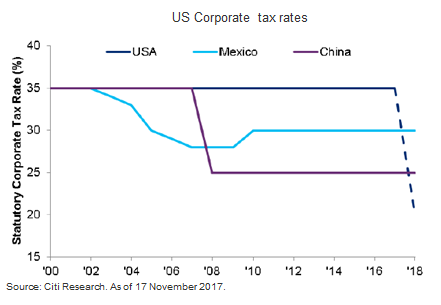 A 20% corporate tax rate would bring the US in line with other developed countries and below the tax rates of China and Mexico in a bid to improve competitiveness. The House version reduces the tax rate on pass through businesses to 25% (from 39.6% for high earners) while the Senate plan would give those business tax breaks but not lower the rate. Lower taxes on individuals: The two plans differ in terms of personal tax rate schedules as well as deductions. Of the two, the Senate plan is more consistent with a middle class tax cut. According to the Joint Committee on Taxation, as of November 15, the Senate's version would produce a 2.8% cut for millionaires in 2027, a 6.1% cut for those earning $50,000-$70,000 and a 10.3% cut for those earning $20,000-$30,000. The Senate proposal doubles the estate tax exemption but does not repeal after six years it as the House version does. Upon completion, tax reform should provide some late-cycle fiscal stimulus. As for S&P 500 earnings per share growth, Citi analysts expects 10-11% gains in 2017 to moderate to 6-7% in 2018 before tax cuts are taken into account.